Some of you have been around long enough to know that most of the time, I work small, and that this is a great challenge, because one doesn't want viewers to look at one's work and remark, "That's a pretty place-mat."! How to mount small pieces? I am still Trying Things On. In the past couple of months, a new art store opened in Lacombe. I dropped in to view its wares (yummy!) and paid a return visit to check out canvases and paint. The owner carries conventional white stretched canvases, yes, but also black SC and -- get this! -- linen SC. The latter, I found, would be perfect for a piece I've made except that it doesn't come in the size best suited to that piece. Sigh. 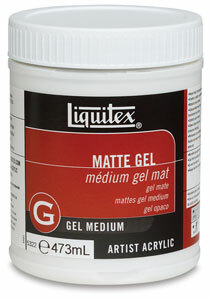 I bought a tube of better-than-craft black acrylic paint (artists' grade at about $17.50 a pop for a 5 fl. oz. tube), a couple of 'better' (i.e. not-box-store) canvases, and came home. I sat with them awhile. Earlier this week, I resurrected a NBS canvas on which I'd unsuccessfully mounted an earlier piece. I figured I had nothing to lose, so I painted it with my new paint. 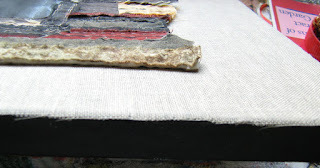 A day or so later, I dug out an odd piece of linen from my embroidery stash (one unrelated to an existing or future project), cut it to fit the top surface of the stretched canvas, and affixed it to same using Liquitex (R) matte gel medium. I've auditioned my piece on this background and am pleased with the results, but have to create and attach a label to it before I mount it to the canvas. The piece has unfinished edges (deliberately) and measures about 8.5" x 11", while the canvas measures 14" x 17.75". I am undecided about where to put a signature, but am leaning toward the lower right-hand corner of the canvas. (There will be a label and signature on the back of the piece as well). "Any questions? Any answers? Anyone care for a mint?" In printmaking we generally sign a print just under the print itself. What about your signature under the art you attached on the lower right corner. Just a suggestion. Maybe take a photo of it and see how it looks on a copy before you actually do it. :) The piece is nice. I love the texture of the stitches and the small pieces .. The suggestion to sign the piece just under the print appeals to me. I am not as familiar with the canvas you refer to so it is a little hard for me to follow the entire process but I like the general idea, Margaret. Having the canvas stand out from the wall on a black base looks really attractive. You could stitch your initials inot th elower right of the art... or yeah, under the art & on the linen.